What is calcium? - calcium symbol. What is the corrected calcium? 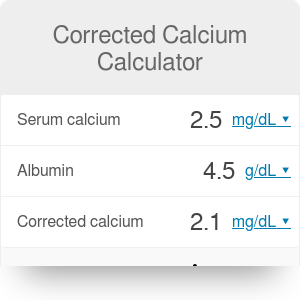 This corrected calcium calculator is a simple tool that allows you to quickly assess calcium levels for patients with hypoalbuminemia (lowered levels of albumin). This article will help you answer the question what is calcium, understand the difference between serum calcium and corrected calcium, and equip you with an easy-to-use corrected calcium equation. We will also cover the topics of the calcium symbol and calcium molar mass, as well as what are normal calcium levels and when to suspect calcium deficiency based on the knowledge of low calcium symptoms. Finally, we will show you foods high in calcium so that, by changing your diet, you can assure calcium benefits for your body. Remember that using this calculator is by no means equivalent to a consultation with a specialist. If the result you obtained is troubling you, make sure to visit your physician! Calcium is the element with the atomic number of 20 (check our atom calculator to learn more about calculating the atomic number and the mass number of different chemical elements). In nature, it is present mostly in the form of calcium carbonate CaCO₃ in limestone and other rocks. We use calcium in the construction industry (calcium carbonate is an ingredient of cement), steelmaking, and in the production automotive batteries and pipe cleaners. Calcium is also essential for our bodies. It plays a huge role in maintaining the correct bone growth as well as allowing blood, muscles, and nerves to function correctly. We have an entire hormone-producing gland (parathyroid gland) dedicated solely to maintaining adequate serum calcium levels! Keep reading to find out more about the optimal value of calcium for your body. You will encounter the calcium symbol instead of the word calcium in many situations, like on the results of your laboratory tests, in formulas using a concentration of calcium, the notes of a fellow student (as a shortcut) or even on the periodic table of elements during chemistry classes. The calcium symbol is Ca - the first two letters of the word Calcium: CA-lcium. You may remember writing it while illustrating a chemical reaction between calcium and water resulting in the creation of calcium hydroxide. Calcium molar mass is the weight of calcium (in grams) divided by its amount of individual atoms (in moles). A mole is a number of atoms or particles of a particular element or substance, which is equal to 6.02214076 × 10²³ (you may recognize this as Avogadro's constant). Therefore, we can say that the calcium molar mass is the weight of 6.02214076 × 10²³ atoms of calcium. It is a fixed value - it measures exactly 40.078 g. Thus, the calcium molar mass is 40.078 g/mol. We often use molar masses of different substances when we want to find out how much of a product we will receive after performing a certain reaction. We use it on a daily basis in any branch of the chemical industry, known as the theoretical yield. Laboratory technicians also need to know the calcium molar mass. They put it in an equation when they want to transform the level of serum calcium from mg/dl to mmol/l or from mmol/l to mg/dl. For quick transformation of molar concentration to the mass concentration of any solution (and the other way round) visit our molarity calculator. Or, if you want to convert between moles, molar mass and weight, use our mole calculator. Normal calcium levels in a healthy adult should fall between the range of 8.8 – 10.5 in mg/dL and 2.25 - 2.625 in mmol/L. A lower than normal calcium levels is called hypocalcemia while the state of higher than usual calcium levels is known as hypercalcemia. Children can have lower and higher physiological calcium levels than adults (a wider range) because their bodies use calcium more intensively for the growth of bones. It is often assumed that the range of normal calcium levels for children is between 7.6 mg/dl and 10.8 mg/dl (1.9 mmol/l and 2.7 mmol/l). For the normal calcium levels in pregnant women, check what we wrote a few paragraphs below. Most of the bodies calcium is stored in the bones; the rest is contained in the blood. If the blood calcium levels drop too low, the bones release calcium. On the other hand, if the calcium levels in the blood are too high, the extra calcium is either stored in bones or removed from your body in urine. There is a problem with the regular serum test though: the calcium measured in your serum in not exclusively "pure" calcium. About 15% of it is bound to organic and inorganic anions, 45% is the biologically active ionized calcium. The rest - about 40% - is bound to albumin. This relation means that, for a patient with low albumin (hypoalbuminemia), the serum calcium levels can be underestimated. For example, a patient with very low albumin level and apparently "normal" calcium level can be suffering from hypercalcemia. To avoid such situations, you should estimate the corrected calcium level. The method of calculating the corrected calcium levels is very simple. It was first described in the paper "Interpretation of Serum Calcium in Patients with Abnormal Serum Proteins". Normal albumin level is typically assumed to be equal to 4 g/dL. The corrected calcium formula is not valid for patients with chronic kidney disease and end-stage renal disease (for more information on that subject, head to the GFR calculator). There are many other tests on humans that need to be adjusted for certain conditions. The results of a serum sodium level test may be incorrect due to hyperglycemia – too high blood glucose level. Visit our sodium correction calculator to learn more about it! Measure your patient's serum calcium and albumin levels. In the field Serum calcium type in the measured serum calcium level. Analogically, in the field Albumin write your patient's serum albumin level. You will get your result in the third field - Corrected calcium. No need to perform calculations by yourself and remember the complicated corrected calcium formula! Our corrected calcium calculator does it all for you! Please remember that you can freely switch units of any typed in values (mg/dl or mmol/l – depending on the preferences of your laboratory). Albumin: 3.5 - 5.5 g/dL (35 - 55 g/L). Let's analyze the following example: you have a patient with low calcium levels (7.2 mg/dL) and with exceptionally low albumin levels (1.1 g/dL). The calcium level suggests hypocalcemia. But should you, in fact, replace the calcium? The corrected calcium level, in this case, is equal to 9.52 mg/dL. It means that the patient doesn't have to be treated against hypocalcemia. The low levels of calcium are in this case an indicator of hypoalbuminemia - this is the health issue that you have to address. In a similar way we perform a magnesium correction for albumin concentration. Results of a serum magnesium level test are also dependent on the patient's albumin level. See how it can be done with our corrected magnesium calculator! Remember to adjust the results with the corrected calcium formula! Are you expecting a baby? Check our due date calculator and find out, based on a date of your last period, when you will give birth. strengthening our bones – children with too low calcium levels (caused by a decreased vitamin D level) suffer from rickets, a disease in which there is decreased mineralization, causing the bones to be deformed. regulating blood clotting – calcium is a part (number IV) of a so-called coagulation cascade – a process leading to fibrin formation. Fibrin, in turn, forms with blood platelets a hemostatic plug stopping bleeding. enabling contractions of muscles – a release of calcium ions (Ca²⁺) to the cytoplasm of muscle cells causes muscle contraction. facilitating correct conduction of neural impulses – calcium channels participate in the creation of the action potentials (depolarization) of neurons. Calcium, in the form of calcium gluconate, may serve as a medication. And it is not solely used in the treatment of hypocalcemia! Healthcare workers can administer calcium gluconate when handling clinical situations like hyperkalemia (too high blood potassium level), hypermagnesemia (too high blood magnesium level), an overdose of calcium channel blockers and, because of its cardioprotective capabilities, to prevent cardiac arrest caused by electrolyte disturbances such as hypocalcemia, hyperkalemia, and hypermagnesemia. It requires, like every drug, careful dosing to avoid any side effects. Use our dosage calculator to make yourself sure that you are treating your patient with the correct amount of any medicine. tissues being resistant to the parathyroid hormone (PTH) - a genetic mutation of parathyroid hormone receptors in tissues. Although, there is a high level of parathyroid hormone in blood, it has a little to no effect on the tissues and the release of calcium to the blood. You can perform some additional tests that can help you diagnose a patient with hypocalcemia: concentrations of creatinine, phosphates, magnesium, potassium, alkaline phosphatase, parathyroid hormone, and vitamin D. An abnormal result of any of these parameters may guide you to the pathology behind your patient's problem. How does a person with hypocalcemia feel? We already know how calcium benefits us and its importance for our bones, blood, nerves, and muscles. Is the lack of calcium causing pathologies of these organs? Can one tell that a person is suffering from low serum calcium level just from his or her symptoms or complaints? Well, an experienced clinician should be able to link the details from the patient's history and at least check his or her serum calcium level. Tetany – probably the most spectacular sign of low calcium levels. It consists of numbness and involuntary symmetric contraction of muscles. At the beginning, it affects muscles of hands, then forearms, arms, face (contraction of eyelids, lips in the shape of letter "o"), chest and legs. It is important to note that the patient remains conscious all the time. Chvostek sign – a clinical symptom checked by tapping at the emergence of the facial nerve on the patient's face (about 2 cm anterior to the ear). In the presence of a low calcium level muscles of the patient's face should contract causing a grimace. Trousseau sign – another clinical symptom. To perform this test, a clinician needs a sphygmomanometer, device used to measure the blood pressure. A doctor or a nurse puts it on a patient's arm and inflates it to reach a pressure 20 mmHg higher than the patient's systolic pressure. This causes an occlusion of the brachial artery, and (in patients with hypocalcemia) cramps in the fingers of the tested arm. Diplopia or a double vision – seeing two images of the same object at the same time. Photophobia – an intolerance of seeing the light, causing discomfort or pain of an eye when exposed to the light. Contraction of bronchi – looking similar to an exacerbation of asthma. A person may have difficulty breathing and start to suffocate. Contraction of coronary, stomach, peripheral and brain arteries. This may manifest in a pain inside the chest reminding of a heart attack, a stomach pain, fingers turning white (the Raynaud symptom) or a migraine-like severe headache. Prolongation of QT in an ECG test that may lead to severe arrhythmias. For more information on QT prolongations and its consequences check our QTc calculator! If you are suffering from a calcium deficiency, you need to get more calcium into your body! You can use some food supplements explicitly produced for treatment of calcium deficiency but why don't you try modifying your diet first? If you look around you will find many other rich sources of calcium, and you don't have to eat rocks and other minerals! As you can see there are many ways of modifying your diet with foods that are good sources of calcium, and it does not have to be boring at all! Let's see what a dietary plan (rich in foods high in calcium) of a person who wants to increase his or her calcium supply may look like. Supper: a salad with spinach and some cheese, maybe feta? Are you interested in changing your diet? Do you want to lose some pounds? Please check our calorie calculator that will help you to determine how many calories you should eat every day. Don't forget to include some sources of calcium!!! Corrected Calcium Calculator can be embedded on your website to enrich the content you wrote and make it easier for your visitors to understand your message.